Get ready for a once-in-a-lifetime Air Race and aerobatic joyflight experience! This is a high-energy aerobatic flight with one of the hand picked, highly trained and skilled pilots from the Matt Hall Racing Team in the aerobatic Extra 300L. 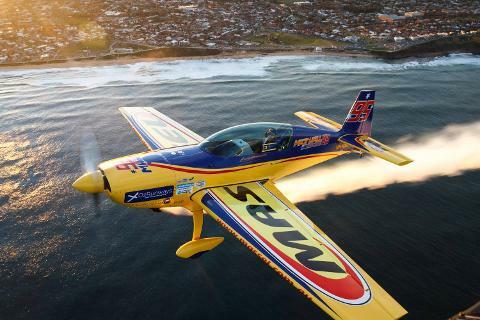 The Extra 300L is the fastest, most powerful and manoeuvrable two-seat aerobatic aircraft in Australia. You'll soar and tumble over the beautiful Lake Macquarie, just an hour north of Sydney. Take in the views of the pristine NSW coastline - including seeing it 'above' you as you are flown along upside down! Experience a simulation of the Air Race, with all the high gravitational forces, high speeds, twists and turns the race pilots endure. Precise aerobatic manoeuvres, including loops, barrel rolls, upside down flying and tumbles. Even if you've never flown before, you are sure to enjoy the sheer power and maneuverability of the Extra. You are in good hands; Every single one of Matt's pilots are former RAAF fighter pilots - our pilots will make sure your experience is the safest and most enjoyable aerobatic joyflight you can get anywhere . - Enclosed shoes required to be worn on the flight; sneakers/runners are desirable.